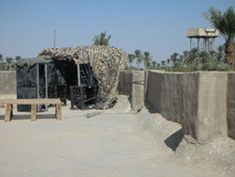 Below are are a few pictures of McCurdy's Armor in use and a word-for-word testimonial from a RECON Marine who used McCurdy's Armor in Fallujah, Iraq. This was an early version of McCurdy's Armor and unfortunately they really didn't know how best to put the gear together, but as Marines do, the improvised as they went along and made their own configurations as they saw fit. This gear did not yet have windows or gunports, so they used windows from destroyed humvees. 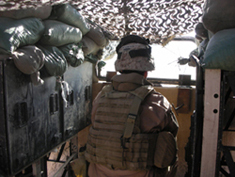 While in use McCurdy's Armor saved Marines lives more than a few times while over there and they loved it. Their mission was to take over houses in uncontrolled areas for a week at a time to run patrols from and set up sniper hides. Every time they took over a new house, the first two nights were wasted because they had to wait until nightfall, shed their bodyarmor and gear to dig sandbags and fortify their location. Once they found this gear and implemented it, fortification went from two nights to a few hours. This allowed them to not only conserve energy and resources, but gave them two more nights of missions and patrolling every time they took a new house. (Equaling out to an impressive 104 more days of running missions instead of setting up out of every 12 month deployment). McCurdy's Armor also allowed them to choose much better locations for their missions due to its flexibility, ease of setup, and better protection. Joe, needless to say the use of your equipment made setting up fortified roof-top positions in our firm-bases more than easy. Prior to discovering what your gear had to offer it is safe to say that it would take my platoon two periods of darkness to completely fortify our firm-base. We would fill hundreds of sandbags in order to build, at a minimum of three solid roof-top positions and sandbag every bottom floor window in the residence we occupied. Not to mention the need to have to tear down the positions once you departed the area. As mentioned above this process took up to two periods of darkness therefore limiting my night-time operations the first two nights in zone. Once I discovered your equipment and was shown how easy it was to assemble I immediately asked if I could have enough to establish my roof-top positions and the supported unit commander said yes. We were already operating with the use of a seven-ton vehicle as lead vehicle. This was mandated by higher and the power was needed to drive the mine counter measure "roller" we had attached to the front of it. So we had the space of the seven-ton in order to transport the gear. 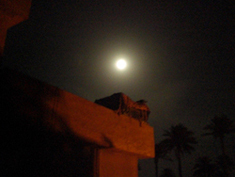 On some other occasions we also stowed the gear in the back of a trailer which was being pulled by an already over-weighted hummer and we had no problems maneuvering through the streets and off-road areas around Fallujah. Prior to discovering/using your gear we had to be very selective when choosing firm bases with regards to homes that had existing "high" walls. We would choose homes with walls that were as high as we could find them. Once on the roof we would have to spend a lot of time hammering out holes in the walls for observation ports. Not to mention having to establish, at a minimum, three solid fighting positions. Sometimes the house with the "high" walls might not always be the best choice with regards to location within your AO. With your gear, it gave us more flexibility when choosing a location. It allowed us to choose a home with the greatest stand-off from the high speed avenues of approach, even if it didn't have extremely high walls. Your gear provided us with a tremendous level of protection, a level far greater than that of eight, ten, or even more inches of concrete or cement. In some cases the roof-top was bordered with a wall of bricks. Not much safety in a wall formed by bricks. Knowing the level of protection your equipment offered gave the Marines on watch a sense of ease, to say the least. From my perspective, it was definitely a force multiplier. 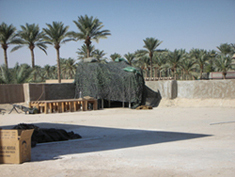 Operations from a firm base held only by a 25 man Reconnaissance platoon commenced shortly after occupation because the gear you guys provided went up with ease and simplicity. Thanks for the work you guys are doing to keep the troops safe.